After the release of my ebook, 12 Days of Christmas Desserts, I swore I would take the rest of December off. Although I'm really pleased with the results, the project was hatched rather last minute. That is, I had exactly one month to develop, bake and photograph TWELVE original recipes in addition to maintaining my regular publication schedule for this blog. Needless to say, after the book's release, I was feeling a little burned out and in need of a holiday. According to Share Our Strength, one in five children in the US struggle with hunger and do not have access to the nutritional food that they need to grow and thrive. 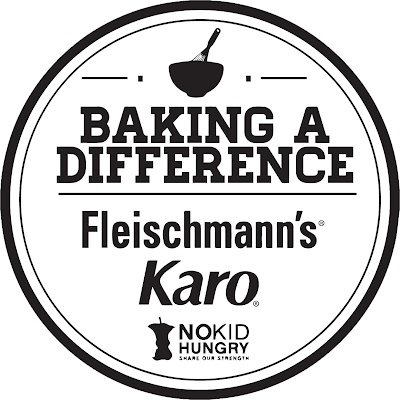 In addition to having donated a generous sum of money to the campaign, Fleischmann's Yeast, Fleischmann's Homemade Baking Mixes, and Karo Syrup invited several bakers (including myself) to increase awareness for Baking A Difference and bake for a cause. The campaign includes creating baking tips and unique twists on classic recipes to encourage more people to get involved in the Baking A Difference campaign. 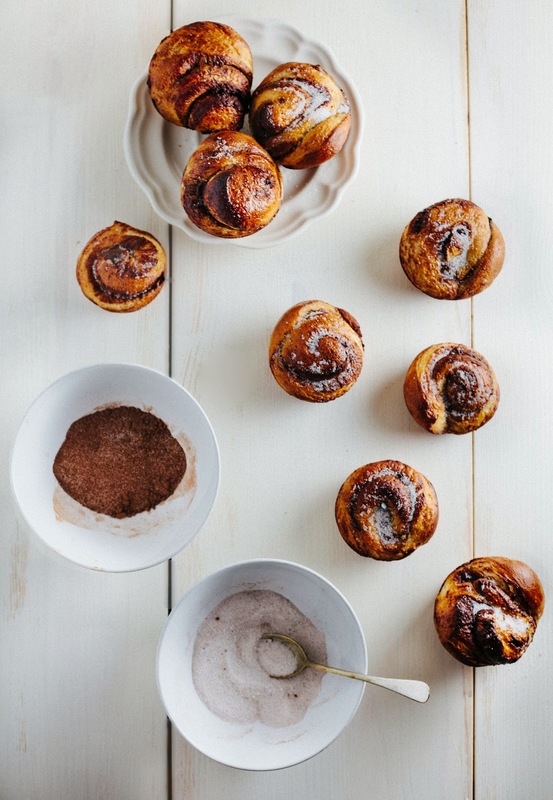 These buns are inspired by your standard cinnamon roll, but with a twist. I subbed out the cinnamon sugar filling with a generous amount of cocoa powder, spiked with Mexican chocolate spices like ground cinnamon, chipotle, clove and cayenne pepper. For those who like a little bit of spice in their food, this dessert is for you! - FOLLOW ME (@hummingbirdhigh) on Twitter. Following me on Twitter gives you 10 entries in the raffle. If you're already following me on Twitter, the widget still allows you to earn 10 entries. - TWEET about the giveaway and #BakingADifference. Tweeting about the giveaway gives you 10 entries in the raffle. - DO BOTH — that is, follow me AND tweet about the giveaway — to achieve 20 entries in the raffle, doubling your chances of winning! Please note that the giveaway lasts for one week and ends next Wednesday, 12/17/2013 at 11:59 PM EST. Unfortunately, the giveaway is for US residents only. A WINNER WILL BE SELECTED AND ANNOUNCED SHORTLY. 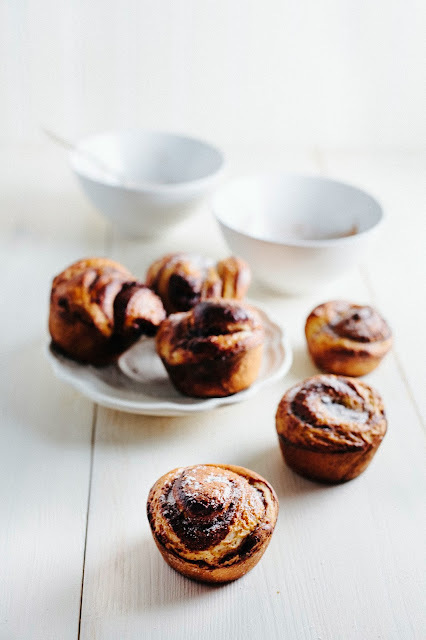 And for those who came for the chocolate rolls recipe, don't fret! I've got it for you below, along with some baker's notes. Enjoy! I know a lot of beginner bakers are intimidated by bread, never mind something like these rolls. But I promise you that this recipe is not something to worry about. The recipe that Fleishmann's provided is almost foolproof. Plan ahead for this one. Although the recipe only requires about 20 to 30 minutes of working time, you do need to allow the bread to rest for 10 minutes and rise for another 45. Traditionally, buns are made from a sweet egg enriched dough like brioche or challah. Since these buns are based on a recipe for white bread, the rolls themselves aren't that sweet and the sweetness comes from the Mexican chocolate filling. You can adjust the filling flavor to your tastes accordingly. If you want more sweetness, don't be afraid to add another tablespoon of granulated sugar. If you want more spice, add an additional teaspoon or two of chipotle powder. Voila! You're a pro baker. Prepare two muffin trays by spraying each muffin cavity liberally with cooking spray or greasing with butter. Set aside. In the bowl of a freestanding electric mixer fitted with a paddle attachment, combine 2 cups all-purpose flour, 3 tablespoons granulated sugar, 1/2 ounce (2 envelopes) Fleischmann's RapidRise Highly Active Yeast and 2 teaspoons kosher salt. Set aside. Whisk together 1 1/2 cups water, 1/2 cup milk, and 2 tablespoons melted unsalted butter in a small, heavy bottomed saucepan. Place over medium heat and heat until very warm, between 120 (F) to 130 (F). Remove immediately from heat and pour into the mixture of dry ingredients (from the 1st step). Stir into flour mixture until the wet ingredients have been fully incorporated, before turning up the mixer to medium speed and beating for 2 minutes. After 2 minutes, stop the mixer, scrape down the sides of the bowl and sprinkle 1 cup of flour over the mixture before turning the mixer back on and beating again at medium-high speed for 2 minutes. After 2 minutes, stop the mixer and scrape down the sides of the bowl and the paddle attachment. Replace the paddle attachment with the dough hook (alternatively, you can also knead the dough on a lightly floured surface), before turning the mixer back on to its lowest speed and adding enough flour to make a soft dough (I used an additional 2 1/2 cups, for a total of 5 1/2 cups in the recipe). Continue kneading on low speed until the dough is smooth and elastic and pulls away from the sides of the bowl, about 8 to 10 minutes. Cover with plastic wrap and let rest for 10 minutes. While the dough is resting, make the Mexican chocolate filling. 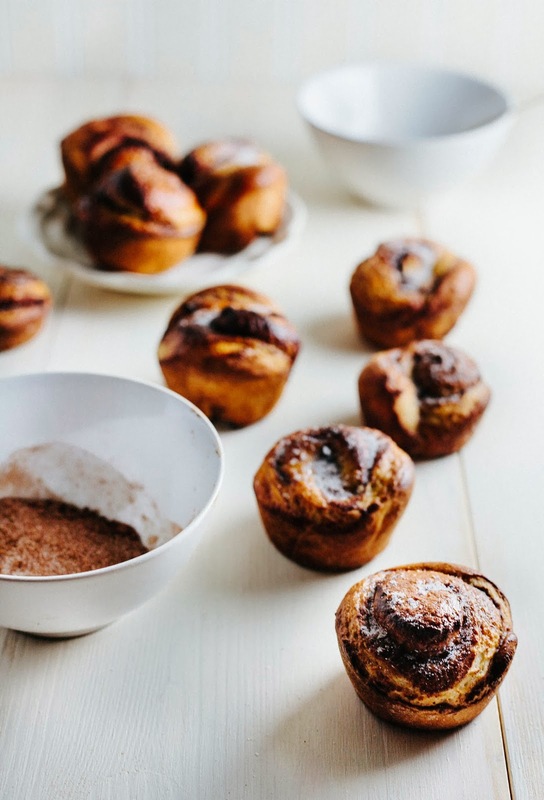 In a medium bowl, whisk together 1/3 cup granulated sugar, 1 1/2 tablespoons unsweetened cocoa powder, 2 teaspoons ground cinnamon, 1/2 teaspoon ground chipotle pepper, 1/8 teaspoon ground cayenne pepper and 1/8 teaspoon ground clove. Set aside. Once the dough has rested for 10 minutes, turn it out onto a lightly floured counter and use a bench scraper or a serrated knife to divide the dough in half. Use a rolling pin to roll each half into a 12 by 7 inch rectangle. Sprinkle the Mexican Chocolate filling evenly over each rectangle. Beginning at the short end of each rectangle, roll the dough up tightly as if rolling a jelly roll or a towel. Pinch the edges of each dough log to seal. Use a serrated knife to cut each log into 12 pieces, each about 1 1/2 inches to 2 inches long. Place each piece, cut side down, in its own cavity in the muffin tin. Cover with plastic wrap and let rise in a warm, draft free place until doubled in size, about 45 minutes. Before baking, brush the top of each roll with the gently whisked egg. Bake in a preheated oven at 400 (F) for 20 to 25 minutes, or until the edges of each bun are golden in color. 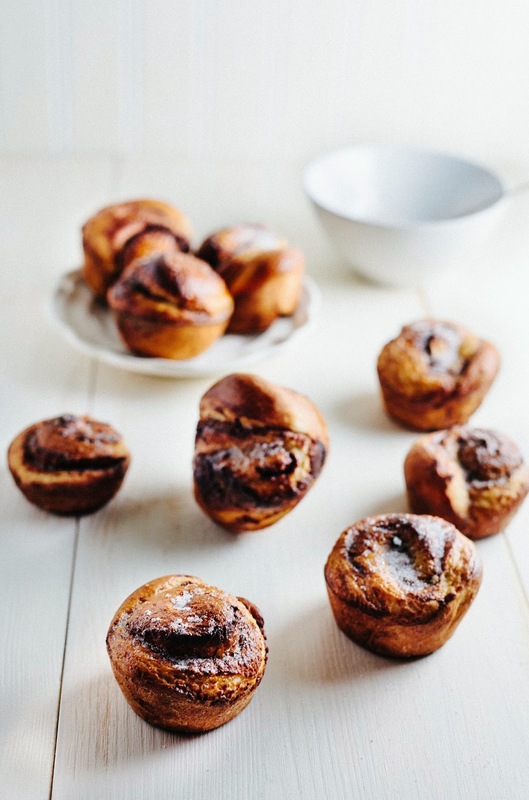 Let cool on a wire rack, before sprinkling with sugar and cinnamon and serving. These are super gorgeous! Mexican chocolate is a nice twist. Oh my gosh these look divine. They'd be perfect for Christmas morning! You are such an overachiever! It is too early in the morning for me to see this. I am now going to have to walk to the nearest bakery. Very nice blog- great job! !